In a small Cup to pour 2 tablespoons of milk and add baking powder. Mix. Beat eggs with sugar and vanilla sugar into a foam. Continuing to whisk, pour a thin stream of oil, knead well. Add the flour, grated lemon zest and diluted in milk baking powder. Knead dough. The dough turns out very tender and soft. From the dough roll cushion, cut into small pieces, which roll into balls about the size of a walnut. The dough balls to put on the sheet covered with baking paper and bake in a preheated 180°oven for 15-20 minutes. The finished workpieces let cool slightly and while still a little warm neatly teaspoon to pull out the middle, but not much, so what then can be stuff. This should be done carefully, because the pastry and quickly crumble, completely cooled crumble stronger. A great option is to jam or preserves, but you can also do cream. For this, is that we pulled from the halves of peaches, it is necessary to grind into crumbs (hands), sprinkle with a little rum, but you can not do that. But just don’t add too much, otherwise it will be hard to beat the taste of rum. Sugar, vanilla sugar and cocoa mix well, add the soft (slightly melted) butter and all beat with a mixer. Continually stirring with a mixer on low speed, add one spoon of our baby. All knead and stuff the two halves. Then connect the two halves together so it looks like the peach. For decoration we need sugar and food dye (red and yellow). You can take a cherry juice or beet and carrot juice. Now in bowls or small cups, filling each about 2 tablespoons of boiled water, dilute the paint: one red and the other orange (mix red and yellow paint, get orange). Can both sides be painted red. In another Cup add sugar. 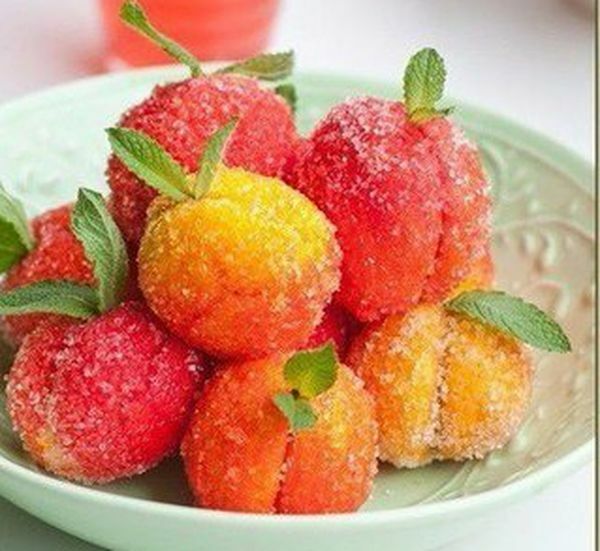 Proceed to the painting: one cheek of peach paint brush in red color and immediately dip in sugar, another paint in orange color and also dip into sugar. Stacked on the sheet or on a large platter in a single layer to alahli. Ready peaches can decorate: take the leaves of the tree is large, wash them, dry with a towel and stick them between the peach halves.